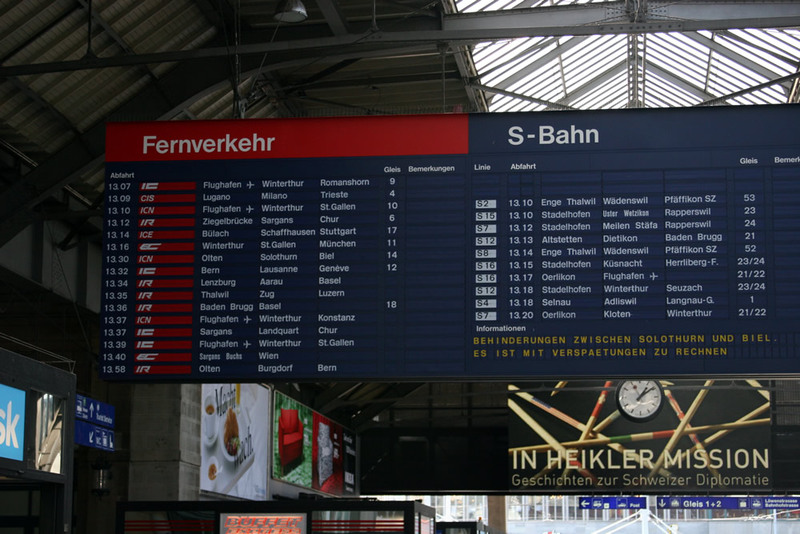 Train information at Zürich Hauptbahnhof in 2007, including the 13:12 InterReggio to Chur. Welcome to “Switzerland Railway Pictorial – SBB and RhB”, an image-rich feature of some of my photos of two of Switzerland’s fascinating railway systems. The SBB is the Swiss Federal Railways, the national railway company of Switzerland, whereas the RhB (Rhätische Bahn) is the independent metre gauge railway of the Graubünden (or Grisons), the largest and easternmost canton of Switzerland. They say “a picture speaks a thousand words” – so I hope that the following photographs and commentary provide an insight into the railways of Switzerland – in Zürich, Grindelwald and the Graubünden area. So, let’s start the journey and take the 13:12 IR (InterRegio) train from Zürich Hbf to Chur via Sargans – the departure board tells us it departs from platform (gleis) 6.